So what is the iPhone Pro? Some new humungously-screened smartphone from Apple that will be a smartphone version of the Apple iPad Pro? No. It actually was a term used by Microsoft CEO Satya Nadella, to describe an iPhone packed with Microsoft's iOS apps. Nadella presented these apps during the recent Salesforce Dreamforce conference. The executive admitted to borrowing the iPhone for the demonstration, most likely to prevent any sort of outcry from Windows Phone users. 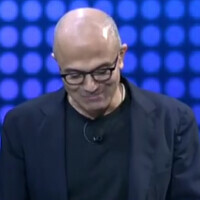 Among the apps discussed by Nadella were Sway, Skype, and Outlook. Not surprisingly, Nadella calls Outlook the best email client for iOS, even better than the native email app that comes with Apple's mobile OS. Eventually, Nadella is going to have to make a tough choice. Microsoft earns more from its Android patents than what it makes from selling Windows Phone handsets. With Windows 10 Mobile soon to be released, and two new high-end models about to be unveiled on October 6th, this could be Windows Phone's last stand. Nadella made an intriguing comment at the presentation about writing the apps for iOS being something that Microsoft "aspires to do." Nadella seems to understand that Microsoft doesn't need Windows Phone in order to play a fairly large role in the smartphone industry. And that is why the Windows 10 Mobile rollout, and the demand for the Microsoft Lumia 950 and Microsoft Lumia 950 XL are important for the survival of the platform, but not necessarily as critical to Microsoft as some might believe. Check out Satya Nadella's introduction of the 'iPhone Pro' at the Salesforce Dreamforce Conference by clicking on the video below. Not really. It's smart to leverage your services on the most widely used platform in the US. Besides, I am really hoping this year is the year i go Windows Phone after being a very satisfied Android phone owner for years. If Bill Gates was still around he wouldn't want to do anything with a company like Apple. Goes to show how far MS has fallen since the good old days of Bill. ummm.... just do some research... bill gates' microsoft actually brought steve jobs' apple from the brink. http://www.wired.com/2009/08/dayintech_0806/http://www.zdnet.com/article/stop-the-lies-the-day-that-microsoft-saved-apple/ two different perspectives. soo... you're wrong on that point. Some people haven't been around long enough on this world, or just plain ignorant. Is that the same Bill Gates appeared on stage with Jobs at the '97 Macworld Expo and announced that they would finally make a proper version of Office for Macs that was ahead of the Windows version and actually support it? And that allowed IE to become the default browser on Macs until Safari came along in 2003? Gates might have absolutely hated Jobs, but he never let that get in the way of a sound business decision. what the hell are you talking about , Microsoft has been making software for apple since ages. Well i don't really care if the MS phone business success it's not that important the only thing that need a success is WM10 Lumia can hold it for later it's really good and important for WM to have flagships from others cause I'm pretty sure that not everyone will love 950/950XL but if you add more options then it will attract a lot more. Yeah right he looks like a joker but still a CEO of world's largest software company. Firing & hiring is part of business. No company can survive by just hiring staff. There is always a restructure. MS is doing really well under his direction. An ex: bringing full Office suite to iOS & Android which is making office suite even more popular. Obviously WP is critical to them. 1. They spent billions on it already 2. They spent more billions to get Nokia to adapt it 3. They then spent more billions for Nokia outright And then there is this os for the desktop called Windows 8-10 that practically was made to prop up WP. It may be the best decision they ever made to support other platforms fully. Why fight a ridiculous uphill battle when you can use your strengths with that of your competition. They know when to cut their losses and move on to a new strategy. The days of monopolist MS might be over and we might finally get a more collaborative and innovative approach from MS.
Apple should go for a 'fatality' and finish off Samsung with an iPhone Pro (6" device) with the spirit of an iPad Pro and a 4" device around April. I think they should piggy back the main devices 4.7" and 5.5" with 6 months lag. This might help to level off Apple revenue through the cause of their financial year. The joke from Nadella clearly went over your head. It's just a vision. I think there is a space for this type of a device, it should be expensive, and unaffordable to the masses, just like gold Apple Watch, but not as expensive and prohibitory to the enterprise market. Nah its Apple and it's business is to make more money that's not what makes more money a phone that performs better after or even close to the next Gen.
Samsung does it, a note 5 is just a blown up S6, but software wise, it is aimed at professionals. Sometimes it's not all about money, it's about brand building. Car manufacturers build hot hatches that don't usually make money but their just there to act as ambassadors for the brand. iPhone pro can be a 'hot hatch' of Apple. It will just be there to change perceptions. Currently some people doubt Apple's engineering superiority due to 'lower specs' on paper but in real life it's a different story. A 6" iPhone pro can be a companion to iPad pro with powerful multitasking ability, compatible with Apple pencil. This is just my vision of iPhone that I wish can come true. I'm not talking about Samsung and your vision is exactly what may never come true since Apple is all about money. He does not have an Apple Watch on his wrist!!!! He has, its called iWatch Pro. I think there will be a Intel powered Lumia maybe they call it a surface maybe it will be there next year. As any smart Las Vegan will tell Microsoft, it's time to shut down production for a minute and reopen the same space with a new look, name and branding. Not that F'in confusing. Pretty obvious. Why the f*%k do I even both trying to support Windows Mobile when Nadella himself is aspiring to create windows for iOS. I mean, $h!t. The ONLY reasonable explanation is that Microsoft is going to take their mobile platform the way of x86 and run it like a mini PC. Which, if true, is genius and I apologize. Otherwise, yeah, MS is completely bonkers and deserves to fail in mobile.